March 5 (Bloomberg) -- Crude oil rose in New York, poised for the third weekly gain in four, on optimism fuel demand will increase amid improved prospects for an economic recovery in the U.S., the world’s biggest energy consumer. Oil also gained on a report that the Organization of Petroleum Exporting Countries will cut shipments by 2.3 percent in the month ending March 20. Crude pared yesterday’s 0.8 percent decline after U.S. initial jobless applications fell in the week ended Feb. 27, easing concerns that a jobs report today will signal a deteriorating labor market. Crude oil for April delivery rose as much as 60 cents, or 0.8 percent, to $80.81 a barrel, in electronic trading on the New York Mercantile Exchange. The contract was at $80.61 at 3:19 p.m. Singapore time. Yesterday, it fell 66 cents to settle at $80.21. Prices are poised for a 1.2 percent gain this week. Initial jobless applications in the U.S. dropped by 29,000 to 469,000, in line with the median forecast of economists surveyed by Bloomberg News, Labor Department figures showed yesterday. A report today may show payrolls declined by 65,000 workers last month, more than the prior drop of 20,000, according to the median of economist estimates. OPEC, which supplies about 40 percent of the world’s crude, will ship 22.87 million barrels a day in the four-week period, compared with 23.42 million a month earlier, the Halifax, England-based tanker-tracker Oil Movements said yesterday in a report. The data excludes Ecuador and Angola. OPEC Secretary-General Abdalla el-Badri said on Feb. 2 that ministers will be unlikely to alter their existing quota of 24.845 million barrels a day unless market conditions change. Compliance with this target is around 55 percent, according to Oil Movements. The group will next meet on March 17. Oil dropped yesterday as the dollar climbed against the euro after European Central Bank President Jean-Claude Trichet kept the benchmark interest rate unchanged and extended some stimulus measures to cement the economic recovery. The dollar traded at $1.3581 per euro at 3:15 p.m. Singapore time, from $1.3581 yesterday. U.S. crude inventories last week climbed a more-than- expected 4.03 million barrels to 341.5 million barrels, the Energy Department said on March 3. Stockpiles in the Gulf of Mexico region, where the majority of U.S. refining capacity is located, climbed by 1.8 million barrels. Some of this gain may have come as a result of the narrowing of the contango, when prompt prices are lower than later-dated supplies, in the market. The price difference between the April contract and May futures has dropped to 42 cents a barrel today from 62 cents a barrel on Feb. 3. Brent crude oil for April delivery rose as much as 64 cents, or 0.8 percent, to $79.18 a barrel on the London-based ICE Futures Europe exchange. The contract was at $78.90 at 3:19 p.m. Singapore time. It fell 0.9 percent to $78.54 yesterday. March 4 (Bloomberg) -- Gold futures fell the most in more than a week as the advancing dollar reduced demand for the metal as an alternative investment. The greenback rose as much as 1.1 percent against the euro as the European Central Bank extended some economic-stimulus measures and left its benchmark interest rate unchanged at 1 percent. Gold rose 24 percent last year as the euro gained 2.5 percent against the U.S. currency. Gold futures for April delivery slid $10.20, or 0.9 percent, to $1,133.10 an ounce on the New York Mercantile Exchange’s Comex unit, the biggest drop for a most-active contract since Feb. 23. The euro also fell after German Chancellor Angela Merkel said a meeting tomorrow with Greek Prime Minister George Papandreou won’t focus on “aid commitments.” Demonstrators occupied the Greek finance ministry today to protest planned budget cuts. “If the dollar continues to strengthen, we might see a halt in gold,” said Sagiv Perez, a senior dealer at Finotec Trading U.K. in London. Also in New York, silver futures for May delivery fell 15.3 cents, or 0.9 percent, to $17.176 an ounce. Platinum futures for April delivery gained 10 cents to $1,583.60 an ounce. Palladium rose, capping the longest rally since October. Futures for June delivery climbed $12.70, or 2.8 percent, to $463.20 an ounce, the sixth straight gain. March 5 (Bloomberg) -- The yen declined against higher- yielding currencies on speculation the Bank of Japan will step up credit easing measures to stave off deflation. The Japanese currency fell against all its 16-most active currencies after Nikkei English News said, without citing anyone, the central bank will likely discuss more monetary easing measures at its two-day meeting starting March 16. The euro is poised for a weekly drop against the dollar on receding optimism that Greece will receive an outside financial aid to fix its debt problems, hurting the confidence in the common currency. “Given the fact that the BOJ is already running far behind other central banks in exit strategies and prospects that interest rates here will remain low, yen-carry trade may become popular again,” said Soichiro Mori, a Tokyo-based strategist at FXOnline Japan Co., a margin-trading company. The yen fetched 89.24 per dollar as of 9:15 a.m. in Tokyo from 89.02 in New York yesterday when it touched 88.14, the strongest since Dec. 10. The euro stood at $1.3586 from $1.3581 in New York, set for a 0.3 percent decline on the week. It bought 121.26 yen from 120.91 in New York. In carry trades, investors get funds in one currency with relatively low borrowing costs to invest at higher yields in another. The benchmark interest rate of 0.1 percent in Japan makes the yen popular for funding such transactions. The cost of borrowing in yen for three months between banks fell below the dollar rate for the first time since August, reducing the appeal of the greenback as a funding currency for leveraged purchases of assets. The new measures by the Bank of Japan could focus on ways to lower short-term rates, the Nikkei said. A decision on specific measures is likely to take place in April, when two board meetings are scheduled, the newspaper said. Brian Kim, a currency strategist in Stamford, Connecticut, at UBS AG, cited the Nikkei story in a research report yesterday, saying the brokerage maintained its three-month dollar-yen forecast at 95. The Bank of Japan unveiled a 10 trillion yen ($112.1 billion) lending facility for commercial banks in December after the yen surged to 84.83 per dollar the previous month, the strongest since July 1995, and government ministers urged the central bank to do more to combat falling prices. A stronger yen pushes down the cost of imports, adding to deflation. Consumer prices excluding fresh food slid 1.3 percent in January from a year earlier, matching the drop in the previous month, the statistics bureau said last month. European Central Bank President Jean-Claude Trichet said it would not be “appropriate” for the International Monetary Fund to aid Greece. The euro rallied on March 3 after Greece announced its third package of deficit-cutting measures as it seeks to alleviate Europe’s largest budget shortfall. Trichet yesterday spoke out against appealing to the IMF “as a supplier of help,” keeping pressure on Greece to cut its shortfall. Greek Finance Minister George Papaconstantinou said the European Union should outline the specifics of an aid package to send a message of “tangible solidarity” to markets. “If they would be clearer in what way they’d help Greece if it were necessary, then Greece wouldn’t need support,” Papaconstantinou told Mega television, according to a transcript of his comments e-mailed yesterday by the Athens-based ministry. The euro has slumped 8.6 percent in the past three months against the dollar amid concern that nations including Greece, Spain and Portugal will struggle to manage their budget shortfalls. Moody’s Investors Service downgraded long-term deposit and senior debt ratings of Deutsche Bank AG, Germany’s biggest bank to Aa3, the fourth-highest level, from Aa1, spurring concerns that credit problems will spread in the region. March 4 (Bloomberg) -- Crude oil traded near $81 a barrel after rising as a U.S. government report showed that refinery operating rates climbed to the highest level since October, bolstering demand. Oil rose to a seven-week high yesterday after the Energy Department report showed refinery utilization increased 0.7 percentage point to 81.9 percent in the week ended Feb. 26. Analysts surveyed by Bloomberg News forecast that there would be no change. Inventories of crude oil climbed 4.03 million barrels, more than three times what was estimated. Crude oil for April delivery traded at $80.94 a barrel, up 7 cents, in electronic trading on the New York Mercantile Exchange at 10:10 a.m. Sydney time. Yesterday, the contract increased $1.19, or 1.5 percent, to $80.87, the highest settlement since Jan. 11. Total U.S. fuel demand, averaged over the past four weeks, was 19.3 million barrels, up 3 percent from a year earlier, the Energy Department said. Oil also advanced as the dollar weakened, increasing the investment appeal of commodities. The common currency rose after Greece approved an additional 4.8 billion euros ($6.6 billion) of deficit cuts. The dollar traded at $1.3705 per euro at 10:13 a.m. Sydney time, from $1.3697 yesterday. Service industries in the U.S. accelerated in February more than anticipated, indicating the economic expansion may soon create jobs following the worst employment slump in the post- World War II era. The Institute for Supply Management’s index of non-manufacturing businesses, which make up almost 90 percent of the economy, rose to 53 in February from 50.5 the prior month. Stockpiles of crude oil rose to 341.6 million, the highest level since August, the Energy Department report showed. Supplies were forecast to rise 1.28 million barrels, according to analysts surveyed by Bloomberg News before the report. An increase in oil supplies on the U.S. West Coast was responsible for much of the nationwide gain, the report showed. Stockpiles there climbed 2.31 million barrels to 51.2 million. The region’s distribution system is isolated from the rest of the country. Brent crude oil for April delivery climbed $1.07, or 1.4 percent, to $79.25 a barrel on the London-based ICE Futures Europe exchange yesterday. March 3 (Bloomberg) -- Gold climbed to a six-week high in New York on speculation that escalating sovereign-debt concerns will boost demand for the metal as an alternative to currencies. Greek Prime Minister George Papandreou announced an additional 4.8 billion euros ($6.6 billion) of deficit cuts as he tries to convince European allies and investors that he can tame the region’s biggest budget gap. Gold priced in euros climbed to a record yesterday. Gold futures for April delivery rose $5.90, or 0.5 percent, to $1,143.30 an ounce on the Comex division of the New York Mercantile Exchange. Earlier, the most-active contract touched $1,145.80, the highest price since Jan. 15. Gold has climbed 4.3 percent this year, while the euro is down 4.2 percent against the dollar. The metal jumped 24 percent in 2009 as record-low U.S. interest rates and government spending weighed on the dollar and countries including India and China boosted bullion reserves. Russia’s central bank wants to increase the proportion of its international reserves held in gold, First Deputy Chairman Alexei Ulyukayev said in an interview published in Izvestia today. His comments were confirmed by a Bank Rossii official. The bank added 100,000 ounces to its reserves in January. “We expect stronger willingness by emerging-market central banks to buy and hold more strategic gold reserves for diversification purposes, due to lost confidence in the dollar,” Bayram Dincer, a commodity analyst at LGT Capital Management in Pfaeffikon, Switzerland, said in a report. Gold may average $1,150 this year as the metal enters a “second golden decade,” he said. Also in New York, silver futures for May delivery rose 26.5 cents, or 1.6 percent, to $17.329 an ounce. Platinum for April delivery gained $7.50, or 0.5 percent, to $1,583.50 an ounce. Palladium for June delivery advanced $5.65, or 1.3 percent, to $450.50 an ounce. FCPO May Futures contract traded RM23 higher as compare to previous trading sessions to close at RM2635 with a total of 4,799 lots traded in the market. FCPO price was trade higher during trading sessions as crude oil and soybean oil were trade higher during overnight and electronic trading sessions. FCPO price retest previous high at RM2638 regions during trading sessions after well holding above support levels at RM2620 regions. Technically, FCPO price seem likely to trade higher once support levels at RM2620 and RM2600 were well holding against the selling pressure during trading sessions. However, FCPO price still seen trading on correction provided resistance levels at RM2645 and RM2662 were not violated during trading sessions. FKLI February Futures contract was traded 5.5 points lower as compare to previous trading session to close at 1283.5 levels with a total of 4,146 lots traded in the market. FKLI was traded lower after marked new high at 1292.5 during morning sessions as regional indices and Dow Jones electronic trading were traded lower in the 2nd half of the trading sessions. FKLI reached higher high at 1292.5 during trading sessions despite our previous anticipation at 1290 regions where 1292.5 levels was 123.6% Fibonacci objective price in a smaller wave count. Technically, FKLI still require further convincing confirmation on attempt to penetrate resistance levels at 1290 and 1295.5 regions in order to affirm FKLI would reverse towards uptrend. Until that happen, FKLI still consider traded on correction phase at wave B seen completed at 1292.5 regions. However, we anticipate great buying interest around support levels at 1278 and 1272 regions. Failure to hold above support levels shall indicate further selling pressure. March 3 (Bloomberg) -- Gold dropped for the first time in five days on speculation that Greece will unveil additional deficit cuts today, stemming a slide in the euro and cutting demand for the precious metal as a hedge. Bullion for immediate delivery fell as much as 0.2 percent to $1,132.80 an ounce, before trading at $1,132.95 at 10:01 a.m. in Singapore. Gold climbed to a six-week high of $1,137.72 yesterday as the euro and pound fell on concerns that the economic recovery in Europe may falter. Gold may also fall today alongside other metals as investors sell copper on speculation that a recent rally isn’t justified. The industrial metal dropped for the first day in four after Chile, the largest producer, said it returned to full output yesterday after an earthquake knocked out power at mines. Among other precious metals for immediate delivery, silver was little changed at $16.8925 an ounce, platinum gained 0.2 percent to $1,575.25 an ounce, and palladium added 0.7 percent to $444.25 an ounce. March 3 (Bloomberg) -- The euro may advance for a second day against the dollar as Greece prepares to unveil new measures to slash the European Union’s biggest budget deficit, spurring speculation a solution to the country’s debt crisis may be near. The 16-nation euro may rise against the pound for a sixth day after Greek Prime Minister George Papandreou told his party’s parliamentarians that “painful” decisions are coming. The Aussie dollar traded near its strongest in a decade versus New Zealand’s currency before a report forecast to show Australia’s economy expanded for a fourth quarter. The euro traded at $1.3613 at 8:09 a.m. in Tokyo from $1.3615 in New York yesterday. The common currency was at 90.96 British pence from 90.94 pence yesterday and bought 120.86 yen from 120.96 yen. The dollar was at 88.78 yen from 88.85 yen. Australia’s currency traded at NZ$1.2990 from NZ$1.2980 yesterday, when it touched NZ$1.30, the most since 2000. It bought 90.39 U.S. cents from 90.35 cents yesterday, when it reached 90.60 cents, the strongest since Feb. 23. Australia’s gross domestic product grew 0.9 percent in the fourth quarter, according to the median forecast of 18 economists in a Bloomberg News survey. The statistics bureau will release the data at 11:30 a.m. in Sydney. The Greek government will announce as much as 4.8 billion euros ($6.5 billion) of additional spending cuts today ahead of a March 16 deadline, bowing to pressure from the EU and investors to do more to tame its budget shortfall, a person familiar with the plan said. The new measures will include higher tobacco, alcohol and sales taxes and deeper cuts in public workers’ bonus payments, said the person, who declined to be identified because the details aren’t public. The euro yesterday touched $1.3436, the lowest since May 18, amid concern Greece may struggle to reach an agreement with Germany on aid. An announcement on spending cuts today would come two days before Papandreou meets Germany’s Angela Merkel and may help the chancellor justify supporting Greece to taxpayers and political opponents who say the country shouldn’t be bailed out after living beyond its means. The euro strengthened yesterday as credit-default swaps linked to Greek government bonds dropped to 320.09 basis points, the lowest since Jan. 19, according to CMA Datavision prices. FPO 3rd month May futures contract traded RM18 lower to close at RM2612 levels as compare to previous trading sessions with a total of 7,057 lots traded in the market. FCPO price traded lower during trading sessions as crude oil and soybean oil were traded lower during overnight and electronic trading sessions. FCPO price opened at RM2635 levels; 78.6% Fibonacci resistance level before plunge lower to support levels at RM2600 regions. Technically, FCPO price encounter some buying interest around support levels at RM2600 regions; 78.6% Fibonacci support levels despite we anticipate wave count 2 met objective price at RM2632 regions. FCPO price remain count on downtrend on medium term provided resistance levels at RM2630 and RM2645 were not violated in the coming trading sessions. However, FCPO price would anticipate certain buying interest around support levels at RM2600 and RM2580 regions. FKLI Mar Futures contract traded 6 point to close at 1289 levels as compare to previous trading session to with a total of 4,306 lots traded in the market. 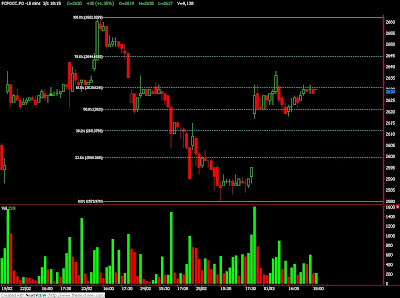 FKLI opened higher as Dow Jones overnight were traded higher due to news release regarding AIG bailout plan. However, FKLI were consolidate since as regional indices doesn’t show any positive reaction during trading sessions especially Hang Seng indices and Shang Hai indices were traded lower. 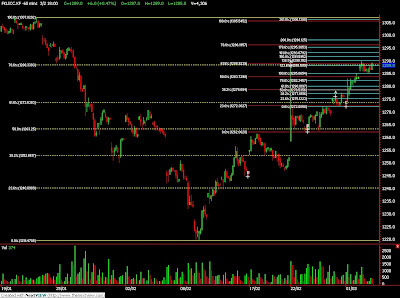 FKLI manage to reach our objective price at 1288.5 regions; 78.6% Fibonacci resistance levels during trading sessions. Technically, FKLI currently traded on critical zone to decide on continuation on correction phase or reserve towards bullish in the coming trading sessions. It’s crucial that resistance levels at 1290, 1295.5 and 1307 are capable to hold against upsurge in the coming trading sessions in order FKLI to remain in correction phase. Failure to hold against the upsurge shall indicate further buying interest. 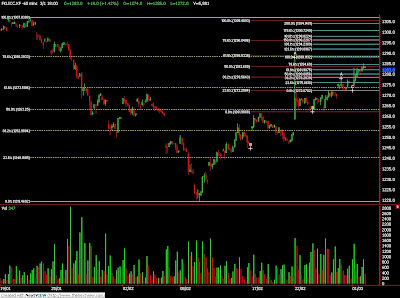 Support levels were seen at 1280 and 1272 regions. March 2 (Bloomberg) -- Oil traded below $80 a barrel in New York before a report that is expected to show U.S. crude supplies increased for a fifth week, signaling demand from the world’s biggest energy consumer may be slowing. Oil dropped 1.2 percent yesterday as the dollar advanced against the euro after a European Union official said that Greece must achieve its 2010 deficit target to regain credibility. Crude supplies probably rose 1.6 million barrels last week from 337.5 million, according to the median of eight estimates from analysts surveyed by Bloomberg News before an Energy Department report this week. Crude oil for April delivery traded at $78.76 a barrel, up 6 cents, in electronic trading on the New York Mercantile Exchange at 10:12 a.m. Sydney time. Yesterday, the contract fell 96 cents to $78.70. Imports of crude oil increased 6.3 percent to 9.08 million barrels a day in the week ended Feb. 19, the highest level since October, the Energy Department said last week. It’s scheduled to release its weekly report tomorrow at 10:30 a.m. in Washington. The dollar traded at $1.3567 against the euro at 10:15 a.m. Sydney time after gaining 0.5 percent to $1.3560 yesterday. A stronger dollar limits investors’ need for assets, such as oil, to hedge against inflation. Brent crude for April settlement declined 70 cents, or 0.9 percent, to settle at $76.89 a barrel on the London-based ICE Futures Europe exchange yesterday. March 1 (Bloomberg) -- Gold was little changed in New York, halting a two-session rally, as the dollar climbed against the euro, eroding demand for the metal as an alternative investment. Silver fell from the highest price in almost a month. Greece must do more to cut its budget deficit, said Olli Rehn, the European Union’s monetary affairs commissioner, after meeting with Greek Finance Minister George Papaconstantinou. Concern about Greece’s debt situation fueled last month’s dollar rally. The U.S. currency climbed as much as 1.3 percent against the euro today. Gold often falls when the greenback gains. “We expect the euro and broad risk sentiment to provide further direction for gold,” James Moore, an analyst at TheBullionDesk.com in London, said in a report. Gold futures for April delivery slipped 60 cents to $1,118.30 an ounce on the New York Mercantile Exchange’s Comex unit. In London, gold for immediate delivery was unchanged at $1,117.60 at 9:07 p.m. local time. Earlier gold rose as much as 0.4 percent in New York as industrial metals including copper climbed. Copper jumped as much as 6.2 percent to a seven-week high on concern that the 8.8-magnitude earthquake in Chile, the world’s biggest producer, on Feb. 27 may disrupt supplies. “Base metals rallied strongly due to the earthquake in Chile and this is one factor that has been pushing other commodity prices up,” said Peter Fertig, the owner of Quantitative Commodity Research Ltd. in Hainburg, Germany. Silver futures for May delivery fell 5.2 cents, or 0.3 percent to $16.469 an ounce in New York. Earlier, the most- active contract reached $16.77, the highest price since Feb. 3. Industrial-metal mines produce more than two-thirds of silver output, as a byproduct, according to Deutsche Bank AG. Also on the Nymex, platinum futures for April delivery gained $4.10, or 0.3 percent, to $1,544 an ounce. June palladium futures advanced $4.25, or 1 percent, to $438 an ounce. CPO 3rd month May futures contract traded RM35 higher to close at RM2630 levels as compare to previous trading sessions with a total of 9,138 lots traded in the market. FCPO price open higher due to crude oil and soybean oil overnight trading and electronic trading stand firm above USD78/barrel and US38 during trading sessions but FCPO price traded sideways since opening due to some profit taking and liquidation position from last week trading. FKLI Mar Futures contract traded 18 point to close at 1283 levels as compare to previous trading session to with a total of 5,881 lots traded in the market. FKLI opened lower as compare to previous month settlement price but traded higher since open for trading as regional indices especially Nikkei and Hang Seng were traded higher despite Dow Jones was not encouraging during overnight trading for past 2 consecutive days. 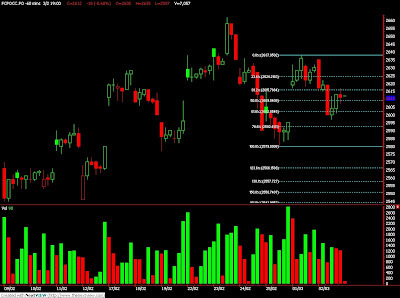 Based on hourly continuous FKLI price chart, FKLI seems temporary support above 38.1% Fibonacci support levels at 1272 regions despite March were trading at 1265 regions in the previous week when Feb contract still the active trading contract month. 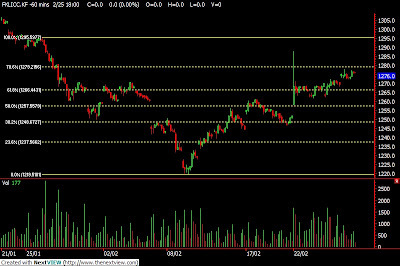 Technically, FKLI seems attempt to challenge resistance levels at 1289 regions; 78.6%, 61.8% and 100% Fibonacci objective figures, provided support levels at 1279 and 1272 were not violated during trading sessions. We anticipated greater selling pressure around resistance levels at 1288 and 1295.5 regions. March 1 (Bloomberg) -- Crude oil rose for a second day on expectations that economic growth in the U.S., the world’s largest energy consumer, and in the emerging markets of Asia will boost fuel demand. Oil extended its 1.9 percent gain on Feb. 26 after the U.S. reported its economy expanded 5.9 percent in the fourth quarter, the most in six years. Saudi Arabia, the world’s biggest crude exporter, agreed yesterday to almost double shipments to India as Asia’s third-largest economy plans three new refineries. Crude oil for April delivery rose as much as 95 cents, or 1.2 percent, to $80.61 a barrel, in electronic trading on the New York Mercantile Exchange. It was at $79.93 at 3:35 p.m. Singapore time. The contract climbed $1.49 to settle at $79.66 a barrel on Feb. 26. Oil gained after the U.S. gross domestic product report showed investment in equipment and software increased at the fastest pace in a decade, renewing optimism that the recession has ended. Federal Reserve Chairman Ben S. Bernanke said last week that the U.S. economy is in a “nascent” recovery. Oil prices are also rising as Asian equities climbed for a second day, led by material-related companies. The MSCI Asia- Pacific Index rose 0.8 percent to 119.06 as of 2:36 p.m. in Tokyo. Japan’s Nikkei 225 Stock Average gained 0.7 percent. Saudi Arabia agreed to increase crude supplies to India to India to 40 million metric tons a year, or about 770,000 barrels a day, from 25.5 million tons a year, during a meeting yesterday between Oil Minister Ali al-Naimi and his counterpart Murli Deora, India’s Oil Ministry said on its Web site. The two sides will also study “enhancement” of joint projects. India is seeking to increase supply for three refinery projects at Paradip, Bhatinda and Bina, the ministry said. It also plans to import more heavy crude oil from state producer Saudi Aramco, according to the statement. The three new plants -- Indian Oil Corp.’s Paradip refinery in eastern Orissa state, Hindustan Petroleum Corp.’s unit at Bhatinda in northern Punjab and Bharat Petroleum Corp.’s Bina plant in central Madhya Pradesh -- will increase India’s refining capacity of 178 million tons a year by almost 20 percent by the end of 2012. Hedge-fund managers and other large speculators increased their net-long position in New York crude-oil futures in the week ended Feb. 23, according to U.S. Commodity Futures Trading Commission data. Speculative long positions, or bets prices will rise, outnumbered short positions by 85,352 contracts on the New York Mercantile Exchange, the Washington-based commission said in its Commitments of Traders report. Net-long positions rose by 16,916 contracts, or 25 percent, from a week earlier. Brent crude for April settlement rose as much as 86 cents, or 1.1 percent, to $78.45 a barrel, on the London-based ICE Futures Europe exchange. It was at $77.89 a barrel at 3:36 p.m. Singapore time. The contract climbed $1.30, or 1.7 percent, to end the Feb. 26 session at $77.59 a barrel. Abu Dhabi National Oil Co., the United Arab Emirates’ state-run producer, deepened cuts for shipments of crude in April because of OPEC limits on members’ output. Shipments of Murban, the largest export grade, and Umm Shaif will be 15 percent less than contracted amounts for April, Adnoc said in a statement today. That’s a deeper cut than the 10 percent reduction in March loadings for those crudes. The Organization of Petroleum Exporting Countries increased crude-oil production by 125,000 barrels a day, or 0.4 percent, to an average 29.17 million barrels a day in February, the highest level since December 2008, a Bloomberg News survey showed. Saudi Arabia led the gain, with output rising 100,000 barrels a day to 8.25 million. The group is scheduled to gather on March 17 in Vienna. Feb. 26 (Bloomberg) -- The Organization of Petroleum Exporting Countries increased crude-oil production to a 14-month high in February, led by a Saudi Arabian gain, a Bloomberg News survey showed. Output rose 125,000 barrels a day, or 0.4 percent, to an average 29.17 million barrels a day, the highest level since December 2008, according to the survey of oil companies, producers and analysts. The January production total was revised 45,000 barrels a day higher. OPEC cut its production quotas by 4.2 million barrels to 24.845 million barrels a day beginning in January 2009 as fuel demand tumbled during the worst global recession since World War II. The group left the targets unchanged at a Dec. 22 meeting in Luanda, Angola. Ministers are next scheduled to gather on March 17 in Vienna. Oil futures have more than doubled to $79.66 a barrel on the New York Mercantile Exchange from a four-year low of $32.40 touched in December 2008, which caused OPEC to curb output. Saudi Arabia, the group’s biggest producer, boosted output by 100,000 barrels to 8.25 million barrels a day, the highest level since December 2008. It was the largest increase of any member. The kingdom exceeded its quota by 199,000 barrels a day. The 11 countries with quotas, all except Iraq, pumped 26.785 million barrels a day, 1.94 million above their target. Compliance with output quotas slid to 54 percent in February from 57 percent in January. All members exceeded their production limits. Angola increased production by 75,000 barrels to 1.945 million barrels a day last month, the most since at least January 2007, when Bloomberg News data on the country’s output began. Angola pumped 428,000 barrels a day above its target. Nigeria’s output fell 85,000 barrels a day to an average 1.94 million, the biggest decline of any member, as militants renewed attacks on oil installations. The Movement for the Emancipation of the Niger Delta, the main armed group in the region, said on Jan. 30 it called off a three-month “indefinite cease-fire” and would resume attacks on the oil industry. Iraqi output slipped 20,000 barrels a day to 2.385 million, the second-biggest decrease in OPEC. Production in Iran, OPEC’s second-biggest producer, declined 10,000 barrels a day to 3.795 million. The country is the biggest overproducer in the group, exceeding its quota by 459,000 barrels a day. March 1 (Bloomberg) -- The yen may decline for a second day against the euro on speculation European Union governments will rescue debt-laden Greece, boosting demand for higher-yielding currencies. The 16-nation euro may advance after French Finance Minister Christine Lagarde said European governments are studying ways to assist Greece. The dollar may fall against the Australian and New Zealand dollars before a report today forecast to show U.S. manufacturing expanded at a slower pace. The yen was at 121.32 per euro as of 8:24 a.m. in Tokyo from 121.26 in New York on Feb. 26. The euro was at $1.3630 from $1.3631. The dollar changed hands at 89.02 yen from 88.97 yen last week. Australia’s currency climbed to 89.90 U.S. cents from 89.54 cents. New Zealand’s dollar fetched 70.05 U.S. cents from 69.82. “I have no doubt Greece will be able to refinance through means we are exploring,” Lagarde told Europe 1 Radio yesterday. Proposals to aid Greece include a combination of public and private options, and Greece will not leave the euro system, she said. German lender KfW Group is preparing measures that are part of a European plan to grant Greece as much as 25 billion euros ($34 billion) in aid should the need arise, four of the nation’s lawmakers, who spoke on the condition of anonymity because the information is confidential, said last week. Greece needs to raise 53 billion euros this year and faces more than 20 billion euros of bond redemptions by the end of May, according to data compiled by Bloomberg. Greece has the cash it needs until the middle of March, Prime Minister George Papandreou told the British Broadcasting Corp. on Feb. 21. The U.S. dollar may fall for a second day against Australia’s and New Zealand’s before a report forecast to show U.S. manufacturers expanded at a slower pace in February. The Institute for Supply Management’s factory index fell to 58.0 last month from 58.4 in January, according to a Bloomberg News survey of economists before the release of the survey today. Payrolls probably fell by 50,000 after declining 20,000 in January, according to the median forecast of 62 economists surveyed by Bloomberg News before the Labor Department’s March 5 report. The unemployment rate may have increased to 9.8 percent from 9.7 percent. Futures traders increased bets that the Australian dollar will gain against the greenback, figures from the Washington- based Commodity Futures Trading Commission show. The difference in the number of wagers by hedge funds and other large speculators on an advance in the Australian dollar compared with those on a drop -- so-called net longs -- was 38,992 on Feb. 23, compared with net longs of 27,003 a week earlier. FCPO May Futures contract traded RM5 higher as compare to previous trading sessions to close at RM2595 with a total of 9,577 lots traded in the market. FCPO price was trade sideways during trading sessions as crude oil and soybean oil were traded without major direction during trading sessions. FCPO price continue to test lower support levels at RM2583 regions; 100% and 123.6% Fibonacci support levels in the 5 min price chart before manage to break up above the resistance trend line at RM2590 regions. Technically, FCPO price seems would rebound higher in the coming trading sessions provided support levels at RM2582 and RM2572 regions where not violated during trading sessions as FCPO price traded above the falling wedge trend line the 5min chart. However, FCPO price still seen bearish on longer trading term provided resistance levels at RM2636 and RM2663 were not violated in the coming trading sessions. FKLI February Futures contract was settle 6 points higher as compare to previous trading session to settle at 1276.5 levels with a total of 4,602 lots traded in the market. FKLI was traded higher as Dow Jones overnight was traded higher while regional indices traded higher during the trading sessions. FKLI search for higher resistance levels after manage to open above previous resistance levels at 1272.5 regions before encounter next resistance levels at 1278 regions; 61.8% Fibonacci resistance levels range from 1288 to 1262 regions. Technically, support levels at 1262 and 1247 were seen crucial as fundamental of the previous upwards trading. Failure to hold above these support levels shall indicates greater selling pressure with assumption wave 4 count complete at 1279 regions; 78.6% and 38.1% Fibonacci resistance levels while wave 5 impulsive wave was expect to trade lower. 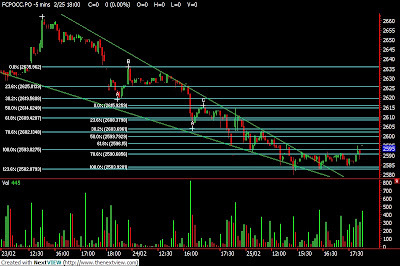 However, resistance levels were seen at 1278 and 1288 region if support levels were not violated during trading sessions.